Just this evening, Marc and I celebrated our first wedding anniversary. We didnâ€™t really do anything much, the two of us just went out on a dinner date at Il Pirata in Eastwood City and saw the Beowulf movie. I guess Iâ€™ve been favoring quieter evenings ever since Sheero passed awayâ€”I still havenâ€™t had the heart to party yet. No, make that six years of being together. Marc and I started going out back in college. And funny how it started too. Anybody who personally knew me and my husband would know how totally different we are. A lot of our friends have wondered how we even got together in the first placeâ€”one of them even marveled at how Marc was able to make me his girlfriend when I had such a strong personality compared to his really shy one. Anyway, as I said, I met Marc at such a funny circumstanceâ€”weird, in a supernatural kind of way. You see, Iâ€™m a very guarded person. I just donâ€™t let my guard down too easily, so very few people could actually say they knew me. Maybe some could at a certain degree, but I donâ€™t think there would be anybody other than my family who could say what there is to know about who I am. I was like that even back in high school, when only two people other than my family knew the real meâ€”a guy named Marc and a girl named Daniella. Now, donâ€™t be confused. That Marc in high school is a different one from the guy I married 😀 So, for the purpose of not confusing you, letâ€™s call the guy Marc the High School Guy and my husband, Marc the Husband. So there. As you all know, it was very hard to keep a platonic relationship between a guy and a girl during the teenage years, unless one of them is gay. So yes, Marc the High School Guy and I became boyfriend and girlfriend. But as it turned out (as most teenage relationships usually turn out), we were better off as friends and remained as such when we went to college. But that wasnâ€™t the exciting part. You see, Marc the High School Guy had Leukemia, and he had already had his third relapse. He wasnâ€™t getting any better. In our third year in college, Marc the High School Guy lost the battle and passed away. Although I kind of expected it, I was still shocked and a bit angry when I heard the news from his younger sister. I acted the way most people do when they lose friendsâ€”I was furious at him for leaving me to fend for myself. He was already one of the only two people outside my family who can say they knew me, and then he had the gall to leave. Well, that was the anger talking. The next day (it was around 3pm, I still remember it so clearly even up to now), I was walking to the cafeteria from class when one of my classmates stopped me and asked me if I had a minute to spare. I was done for the day, so I agreed. Guess what? He introduced me to Marc (the Husband), who was asking for help on his animation project due the next day (what a gentleman! Haha). That wasnâ€™t the first time Iâ€™ve seen him, but I never really knew his name. 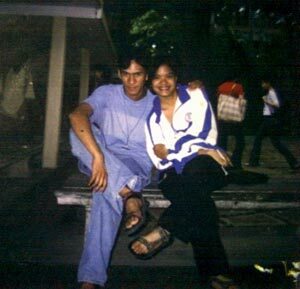 I just knew that he was a volleyball teammate of one of my closest buddies. Heck, I even thought he was gay. Hehe. We were just in totally different social circles that I never really hung out with him, let alone know his name. So yeah, I was surprised when I found out his name was Marc, and even more shocked when I learned he spelled his name the same way as my late friendâ€™s. We were different as night and day, but surprisingly, we got along well. I found it so easy to talk to him, and I can still remember the fun I had helping him with his projectâ€”ok, fine, I did all the work! Haha. So anyway, for wasting my time, he treated me to dinner. After that dinner came another date. And another. And another. Then, you know what happened. It’s pretty obvious 😛 We started dating exclusively, and eventually got married last year, in the afternoon of the 25th of November. Maybe it was just a coincidence, but I always thought that Marc the Friend-Who-Passed-Away sent him to take care of meâ€”my husband is my angel, who sometimes doesnâ€™t act like an angel 😀 Hehe. Anyway, Marc and I invited my late friendâ€™s parents to our wedding. My parents knew his dad anyway, since he was also our Baranggay Captain. They also attended a Christmas get-together here at our home, where an uncle of mine wanted to talk to his dad about some Baranggay-related stuff. Before they went home, they asked how Marc and I met. We told them, and by the time we finished, they were both teary-eyed. As it turned out, my friend passed away at 3am in the hospital. It seemed such a coincidence that Marc and I would meet at 3pm exactly the day after his passing on our third year in college. Whatâ€™s up with the number 3 anyway? Frankly, I donâ€™t really know. All I know is that Iâ€™ve finally found the one person who would know me, the person I would share the rest of my life with, and the person who really, truly knows the real meâ€”without the boundaries. This entry was posted on Sunday, 25 November 2007 at 11:20 pm and is filed under Anniversaries, Marriage, My Family. Ang cute ng pic ninyo! 🙂 Congrats! uy assoc benches. belated merry christmas! been a bit away from the blogosphere.